Many of us already knew this to be true. The more clear a person is about their personal values, the more able they are to commit to an organisation. The more committed you are to an organisation the better you perform for that organisation. James Kouzes and Barry Posner, famous for their Leadership Challenge series of books have provided the evidence that awareness of personal values matter as they relate to organisational commitment and performance. In The Truth About Leadership (2010) they show the result of their work with thousands of participants. 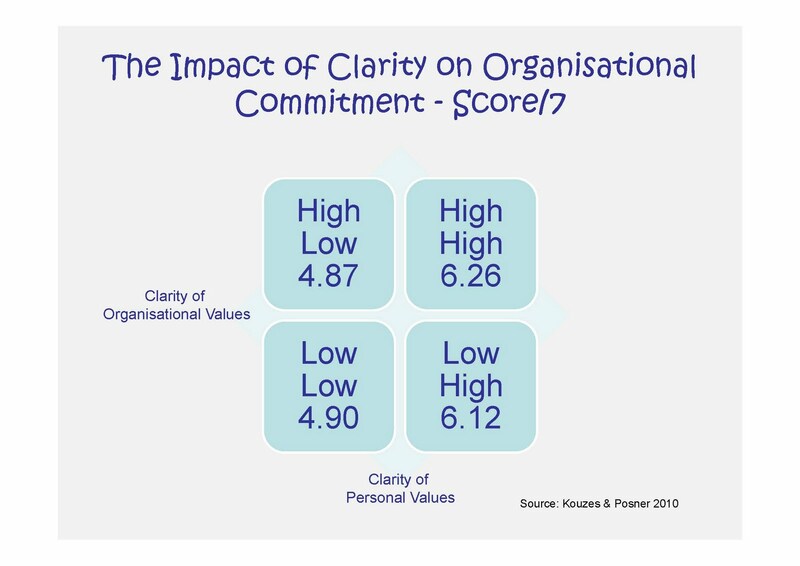 As the illustration highlights (where the highest possible score in any one box = 7), their is no significant difference between the commitment of employees who have both clarity of personal and organisational values compared to those who only have clarity of personal values. 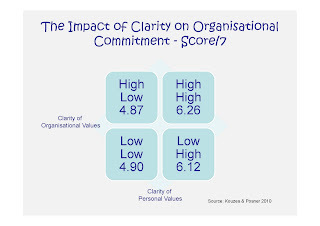 There is however a significant difference in terms of both of those two groups compared to employees who have low clarity of both personal and organsiational values and those employees who have high clarity of organisational values but low clarity of personal values (once again there was no significant difference between these two scores). So what does this mean in English? It means that it is worth assisting your employees to gain clarity about their personal values. How many organisations do that? Not many from my experience. And while there appears to be no significant difference between just having clarity of personal values and having clarity of both personal and organisational values, it makes sense to me to have both if you can. But the starting point is personal values. Help you employees to know them. The reality is that it isn't very hard to help people to clarify their personal values. You just have to know what to do and how to do it. Within my online community (The OTM Academy) I have a six minute video that helps people to clarify their values, or you can simply follow the instructions laid out in my book What Really Matters For Young Professionals! Are you clear about your values?